udaipur. 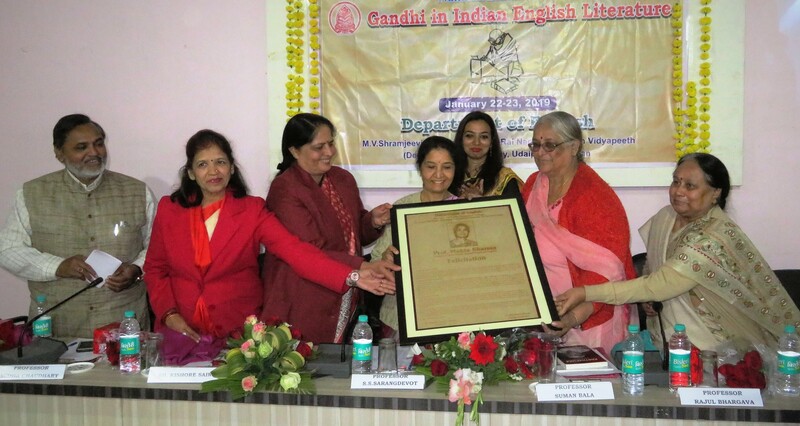 A two-day National seminar was organized by the department of English, M.V.Shramjeevi College, Janardan Rai Nagar Rajasthan Vidyapeeth ( Deemed to be ) University, Udaipur on 22-23 Jan 2019 to commemorate the 150th birth anniversary year of Mahatma Gandhi. In this two day seminar forty five scholars presented their research papers from different parts of the country. The discussions led to the conclusion that both Karl Marx and Mahatma Gandhi had influenced twentieth century. Although western capitalist model today dominates the world but it has given rise to several challenges and problems in the world. The philosophies of Mahatma Gandhi and Karl Marx together can provide the means to address these problems. The two -day National Seminar began with the inaugural session in which the Chief Guest Prof. Suman Bala , Professor of English retired from Delhi University made the inaugural address. In her speech she mentioned the influence of Mahatma Gandhi on Indian literature. She referred to the novels Untouchable by Dr. Mulk Raj Anand, Kanthapura by Raja Rao, Waiting for Mahatma by R.K.Narayan, the Gandhi Quarteret by Chaman Nahal, Mrityunjay by Shivaji Sawant and several other texts from Indian languages to trace the influence of Gandhi on Indian Literature. Prof. Rajul Bhargava, key speaker of the seminar spoke about the place of Kasturba in the life of Gandhi and her depiction by authors on Gandhi. She said that Gandhiji practiced all his novel ideas and principles on Kasturba who accepted his command and followed them all in letter and spirit. But she did not get the desired attention by the biographers of Gandhi. She said that Gandhiji's experiments with truth would have not become a reality had Kasturba not stood by him throughout her life. Special guest Mr. Kishore Saint , noted Gandhian scholar and activist said that Gandhi and Marx can converge at the issues of ecological balance, curbing consumerism and containing violence in the world. He said individually one cannot meet the challenges of our times but if a fine combination of the two philosophies can be struck it may help mankind. He said that consumerism has already damaged the world too much. Opposed to that, Gandhian philosophy advocates limiting one's needs and Marxist philosophy advocates equitable distribution of resources and opportunity among all. This can only sustain the world. Guest of Honour Prof. Sudha Chaudhary, Professor and Head of the Department of Philosophy, M.L.Sukhadia University said that no philosophy can be complete in itself. One needs to examine each philosophy in the context of time and then see if that suits the occasion. Presiding over the inaugural session Prof. Suman Pamecha , Principal, M.V.Shramjeevi College stated that the literature related to Mahatma Gandhi is highly motivational and can inspire people to lead a virtuous life. In the beginning of the session Prof. Mukta Sharma, Head Department of English welcomed the guests. Prof. H.S.Chandalia, convener of the seminar gave the concept note and stated that Indian English Literature was immensely influenced by the life and thoughts of Mahatma Gandhi. He also mentioned several English and Hindi authors who had depicted Gandhi and his ideology in their writings. Talking about the reason of organizing the seminar he said that in the present times the parties in power are demeaning Gandhi and elevating Sardar Patel. They are demonizing Nehru and celebrating Godse. In such a situation it is necessary to revisit Gandhiji and his ideology. The session was conducted by Dr. Mehzbeen Sadriwala and Dr. Preeti Rajput proposed a vote of thanks. The special feature of the inaugural session was the felicitation of Prof, Mukta Sharma for her life time achievements and contribution to the world of academics. Prof. Suman Bala and other guests felicitated her with a citation, shawl and coconut, the sacred fruit. The inaugural function was followed by a plenary session in which Dr. Rajshri Ranawat , Associate Professor, Jai Narayan Vyas University, Jodhpur delivered a lecture. This session was chaired by Prof. Sunil Bhargava, retired Principal, Govt. PG College, Jhalawar. On the second day of the conference Dr. Jaishree Singh , B.N. University and Dr.Kshamta Chaudhary, VMOU, Kota delivered plenary lectures. In technical sessions which were chaired by Dr. Sumer Singh, Principal, Govt. Girls College, Ratangarh, Dr. K.S.Kang, Maharana Pratap Government PG College, Chittorgarh and Dr. Rekha Tiwari, Guru Nanak Girls College, Udaipur. The valedictory session was chaired by Prof. Suman Pamecha, Principal , M.V.Shramjeevi College. Prof. Pradeep Trikha, Professor and Head, Department of English, M.L.Sukhadia University was the chief guest while Dr. Minakshi Jain, Associate Professor, M.L.Sukhadia University was the guest of honour. Prof. The guests gave away the certificates to the delegates. , H.S.Chandalia proposed the vote of thanks and announced that selected papers of the seminar will be published in a book form.